The answer: One of the most physically demanding experiences of my life! And one of the most rewarding! 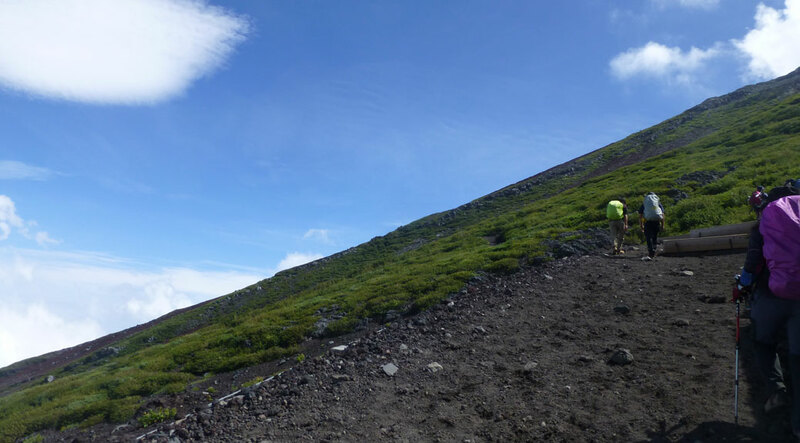 We had a couple warm-up hikes during the summer, reaching the 1,200-foot peak of Hiwada, Takasasu and Monomi and Mitsumine’s 3,600-foot summit in July. 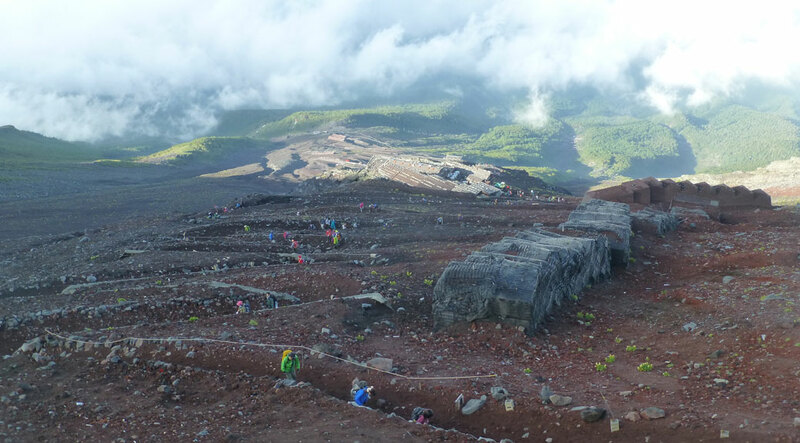 But they certainly didn’t prepare us for the physical overnight grind of Fuji’s 12,388 foot (3,776 meter) ascent. 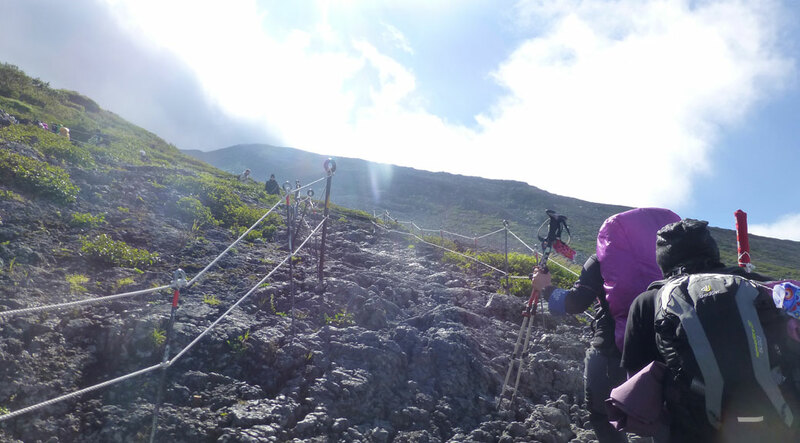 We started out from Fuji’s 5th Station, around 7,500 feet (2,305 meters) above sea level, at 11:30 a.m. The 5th Station is the most common starting point for the ascent with regular bus service, parking, restaurants, lodging and gift shops. Smartly, we took advantage of our tour company’s rain suit rental. The weather was temperamental at the beginning with strong winds and rain. Fortunately, the weather broke quickly and we were able to shed some of our layers before too long. The lower part of the climb is mostly packed dirt and rock trails with a reasonable incline. We saw several families with kids early on, likely making a short day hike. About an hour in, we reached the 6th Station and stopped for a short break to take in the view. Our trail guide, Midori, gave bits of information about the mountain along the way. Fuji is still an active volcano that last erupted in the 1700s. During the Edo Period (1603-1868), an entire religion (Fujiko) was built around worshipping the mountain. Due to it’s cultural importance, UNESCO named it a World Heritage Cultural Site in 2013 instead of adding it to the Natural Site list. 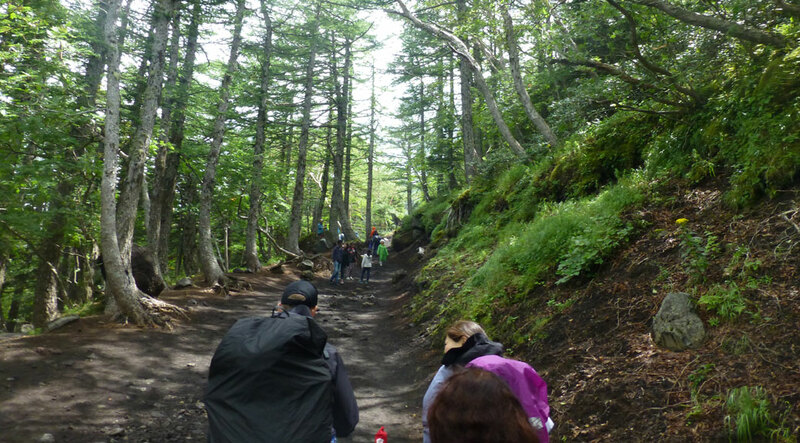 Beyond the 6th Station, the trail becomes a series of switchbacks with rest stations at regular intervals. The views of the cities below, as well as the view of the part of the mountain you’ve already conquered, give you the sense of being on top of the world. However, Fuji still has a lot of surprises in store. The drastic slope of Mt. Fuji. This is what you’re up against. Beyond the 7th Station, the climb starts to get pretty technical in some places. Fortunately the rain had stopped, so the rocks were dry and traction was good. A side benefit of the rain was that the ash-covered paths had dried firm, making the non-rocky parts of the path fairly easy for walking. Our goal for the first day was the Tomoi Hut at the 8th Station (11,154 feet/3,400 meters). 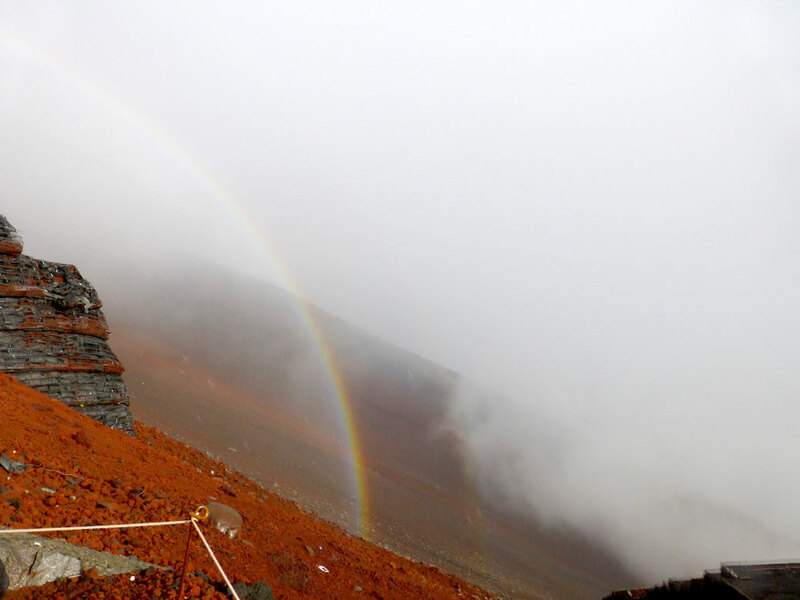 Our good fortune ran out about 20 minutes before we reached the hut as the skies opened up and rain poured down. By the time we reached the hut, we were soaked from head to toe. While the rain gear did its job, our backpacks were soaked through (including the plastic-wrapped change of clothes) and our shoes and socks collected the rain like a dish sponge. Drenched to the bone, we reached the hut around 5 p.m. As we entered, a man blew the water off us with a leaf blower. Then, three or four people with hand towels wiped off the excess rainwater. 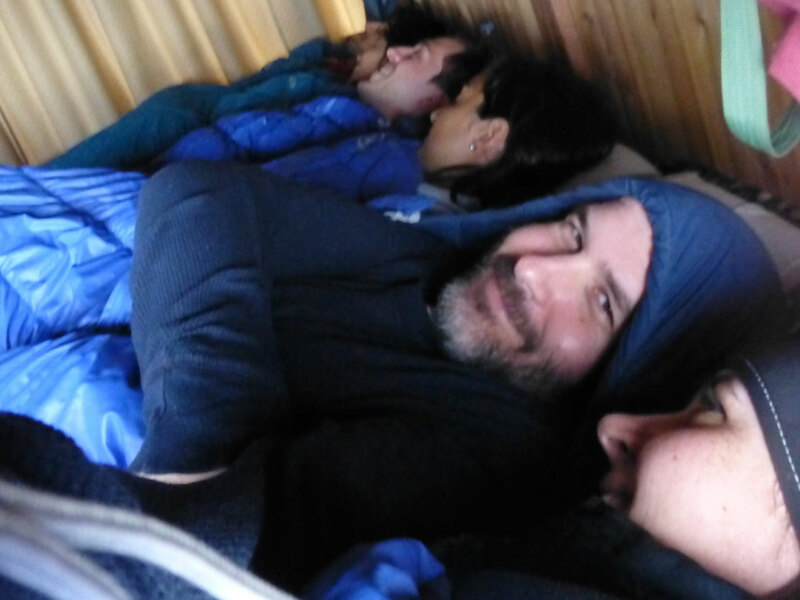 We had to remove our wettest items on a tarp in the dining area and received a patdown to make sure we were dry before being allowed into the sleeping area. So… the sleeping area. It’s basically a large wooden platform with six sleeping bags in a space made for about five people. They’re set up bunk-style, so there’s another platform below us with another six climbers. We were paired up with a group of tourists from France. Fortunately, they were pretty cool and didn’t snore. After a short rest, we were called for dinner. We sat at a long table and had udon noodles with rice, relish (tsukemono) and green tea. It was a perfect meal to warm up the insides. 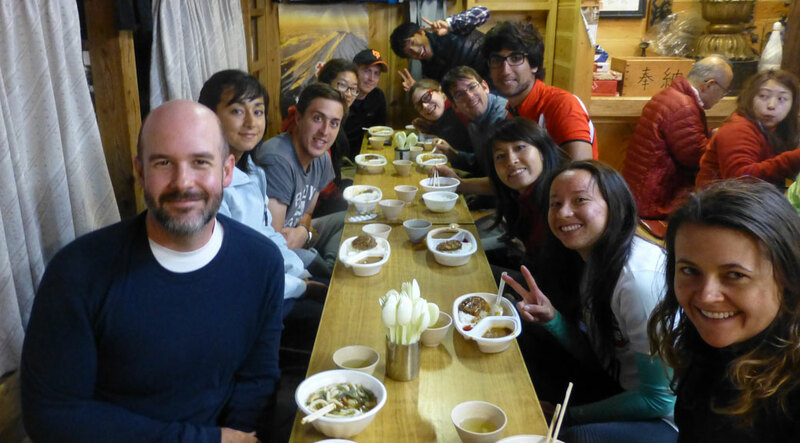 We ate with the rest of our hiking group: Our bunk mates from France, a woman from Brazil and a couple from Baltimore who were visiting her brother, a Navy man stationed in Yokosuka. After dinner, we were encouraged to get as much sleep as we could. We’d have a 1 a.m. wake-up call to start our ascent to the summit. I’m not much for sleeping in strange places and, making the mistake of getting in the bunk first, I was between everyone and the window. I’d guess I got about an hour of sleep tops and had to do a bit of meditating to get past the claustrophobia that set in more than once. Our guides woke us up a little after 1 a.m. and I peeked out the hut window. 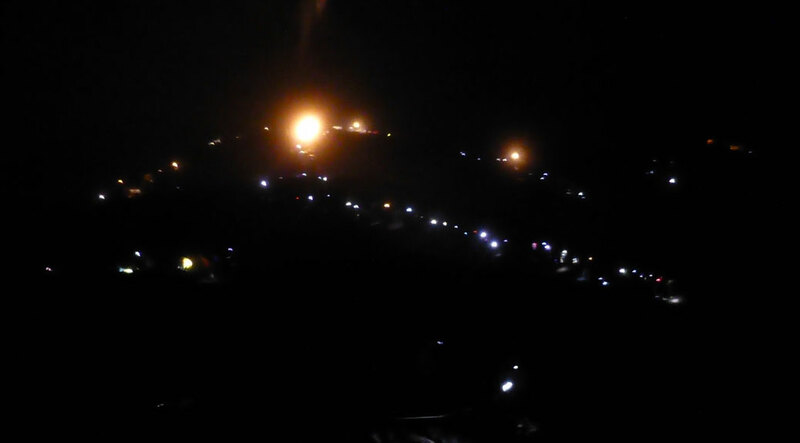 Little white lights dotted the night sky for as far as I could see. We wouldn’t be alone in our trek to the top. 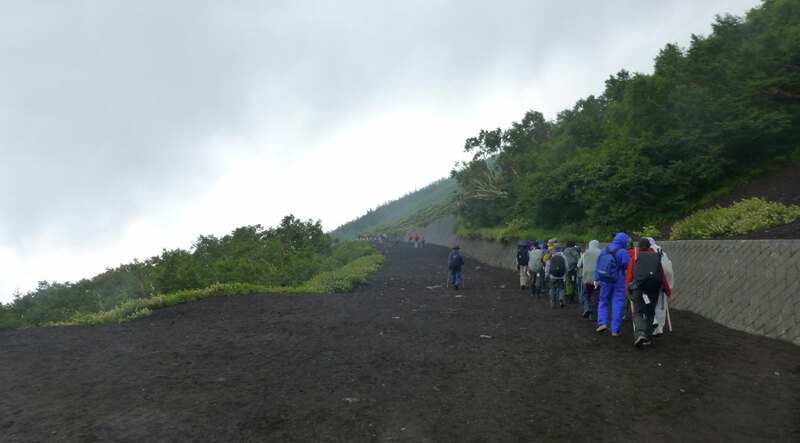 While the last 1,000 feet from the 8th Station to the summit is only about 30 minutes worth of climbing, it actually takes about two hours because there are so many people. The rain never let up during the night, so there was a lot of stopping and waiting with nothing to do but get wet. The summit of Mt. Fuji! We made it! Around 4:15 a.m., we finally made it to the top. 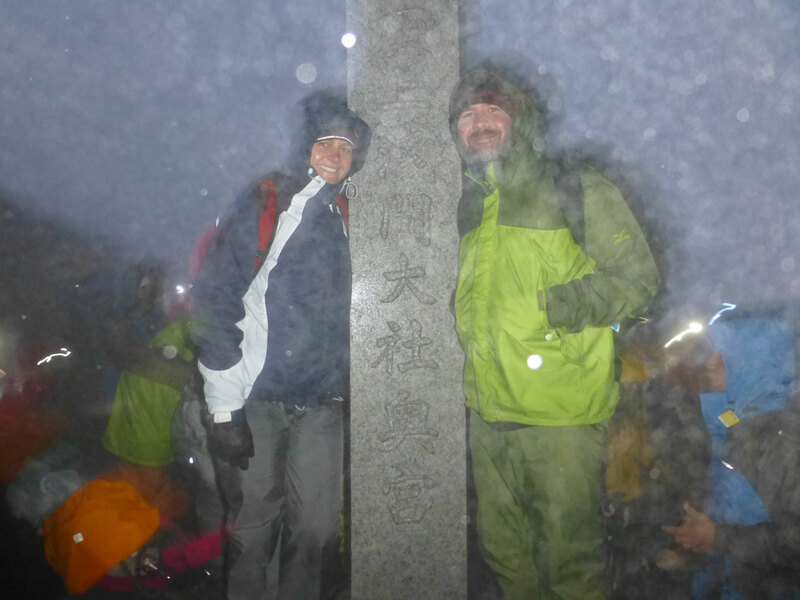 It was cold and rainy, but exciting to be at the summit. A large crowd waited for their turn to get into the snack shed where a small paper cup of 500 yen coffee waited for us. We tried our best to warm up for about 15 minutes. Our guide offered a tour around the crater, but there were no takers on this morning. The hut had packed up breakfast to go, which consisted of rice and a piece of fish. We gave the fish to our hiking buddies from Baltimore and carb-loaded on the rice. So, here’s the thing you don’t really think about when you say “Let’s climb Mt. Fuji!” There’s only one way down and it involves another four hours of climbing. “It’s all downhill,” you tell yourself. But the ash on the descent path is thick and filled with round rocks that are perfect for tripping over. I only fell once on the way down and used my ninja-like agility to get back up quickly. The reason you try to reach the summit around 5 a.m. is to view the sunrise. With the rain and fog set in so thick, we didn’t expect to see anything. But, a little after 5 a.m., something happened. The rain stopped. A hint of orange started to fight its way through the gray clouds. 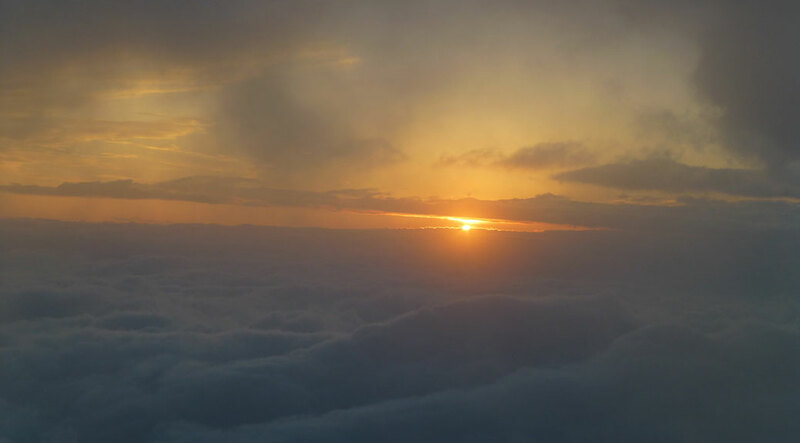 Finally, the clouds succumbed to the sun… magical! From this elevation, you’re actually above the clouds. The sun rises at eye-level and it is magnificent. With nothing between you and the sun but a horizon of clouds, it’s as close to Heaven-on-Earth as you may ever find. Not long after the sunrise, we came around a corner to find another side benefit of that horrible rain. A full rainbow curved across the sky, settling into the ground just feet from us. However, our pot of gold was still a few hours away. 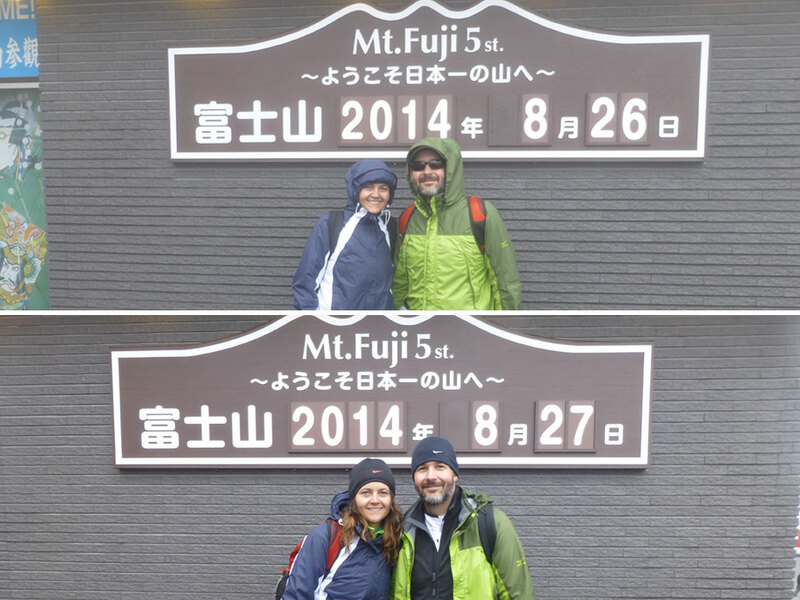 At the beginning and at the end… I think we look a lot better than we felt at the end of the climb! A little after 9 a.m., we reached the 5th Station. The grueling terrain on the way back still aching in our legs, we were sure glad to be at the finish line. 22 hours, 9,600 feet of elevation traversed and one experience of a lifetime! Take the tour. Definitely spring for the tour company (we used Willer Express and would recommend them again) and take them up on their entire rental package. The rain gear was money well spent, but a headlamp and waterproof backpack with cover would have been a great addition. They also handle the hut reservations and dinner/breakfast. Plus, most companies (ours included) take you to an onsen afterwards. There’s nothing better than a soak in the tub after that hike! Prepare for the rain and cold. I had a base layer, cotton shirt, DriFit pullover, fleece jacket and rain jacket and my teeth were still chattering at the summit. Bring lots of layers as the temperature difference between the 5th Station and the summit is pretty extreme. Make sure to have waterproof boots and waterproof gloves as well. My gloves were soaked and freezing. My two layers of socks were the only thing that kept my toes from freezing off. Stash a full set of dry clothes at the 5th Station. There are coin lockers at the 5th Station. I wish I’d stashed a complete set of dry clothes, including shoes, in one of those lockers. While the onsen was great, it was awful having to put wet clothes on afterward. Check the calendar. The climbing season for Mt. Fuji is pretty short. 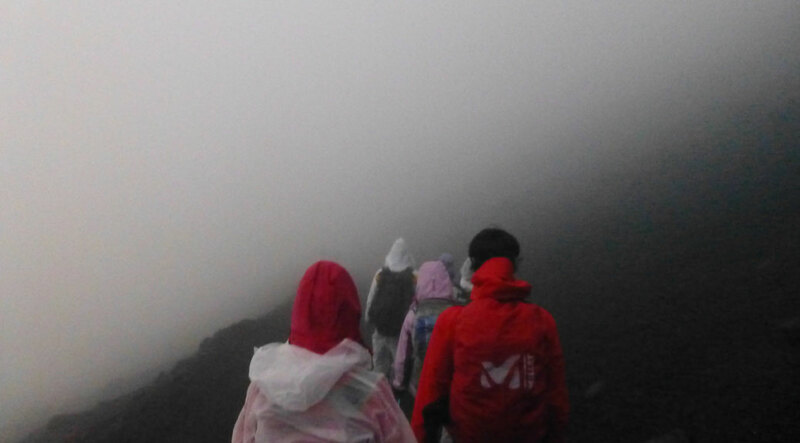 If you’re planning to climb Fuji, make sure to schedule your trip between early July and mid-September. Trails and huts are closed the rest of the year. Fantastic! I really enjoyed this interesting decription 🙂 I was totally drawn in while reading. Sounds like you had fun, despite the lessons learned. Enjoyed reading your description of the hike. Kudos to your and Viktoria. Thanks! It was a lot of fun even with those learned lessons.